We are regulars and love your food and the fabulous time we always have at the Barstow House. I just saw from your ad in the Tioga Courier that you had a web page and decided to check it out. We have added it to our favorites so we can see what the special is before we come. I assume we can even make a reservation in the future by using this link. In any event, keep up the good work. We refer all our friends to your restaurant. Thank you. We enjoyed our dinner Sunday very much. It was relaxing and the eats were good.I like the new menu, lots of good choices. …Thank you Chef Steve It’s my husband’s birthday and it is a special treat for him to have one of your steaks, which he says is the best in the area. We had a great dinner at Barstow House (Steak au poivre and Veal saltimbocca). Thanks! And thanks for improving the wine list. Steve, We recently ate at your fine establishment and enjoyed our meal immensely. Our dinner was one of the finest meals we have eaten in a long time. You have one of the nicest restaurants in the Southern Tier. Sue Welsh and Charlie Munroe. Thanks for a wonderful meal last night…always a pleasure to come for dinner. We are so thankful to have such a wonderful place to eat here in Nichols. Thanks for the photo…We hope you all have a wonderful holiday and are able to enjoy the New Year! 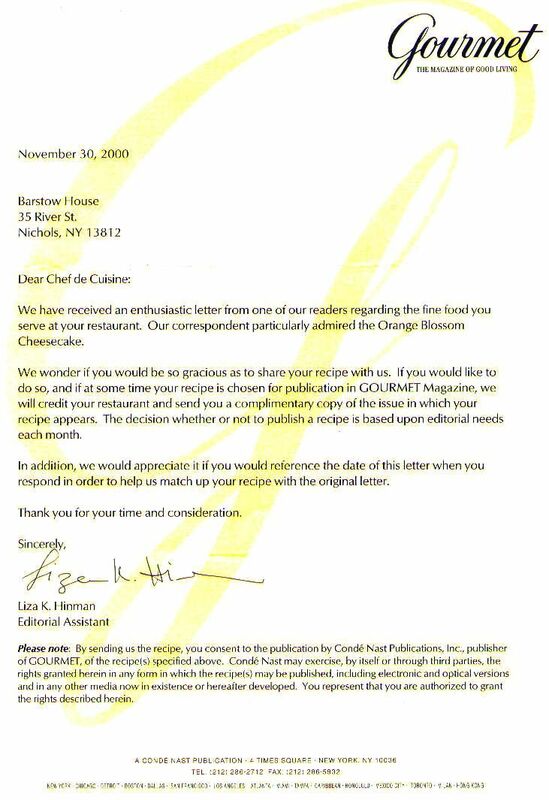 Dear Chef, We both had the shrimp Primavera tonight as usual, it was so good!!! Everything in the dish has wonderful flavor and texture. We’re sure that no one could prepare it better. Thank you for another lovely evening: absolutely great meals, friendly and courteous service, pleasant comfortable surroundings. What more can we ask for? My sea bass was outstanding. My husband thoroughly enjoyed his perfectly cooked filet mignon. Veggies were great too – zucchini and carrots. Of course, we ended the evening with your delicious orange blossom cheesecake and coffee. Thanks again. Steve My wife and I eat at your establishment quite often, and I must say the food is exquisite! But there is one dish in particular that I feel far exceeds the limits of culinary excellence. Its your Salmon! I have had this fish many other places, and since I am a fisherman, have even tried to cook my own. Unfortunately none of these others can compare to yours. I have just returned from a fishing trip to Erie, PA with several Steelhead Trout, which are very similar to Salmon. I was wondering if you would be so kind as to share your recipe with me so I could attempt to prepare these fish. Thank you for your time, and keep up the good work. Hi Stephen, My husband and I have enjoyed the gourmet food at your restaurant for years now. We have taken many vacations to several resort areas, where the food has been very good, but we still haven’t found a restaurant that offers the quality and expertise of the food right back home at The Barstow House. We feel fortunate to live so close to your restaurant. You are a fantastic chef. Sincerely. Things have been so hectic that I never really did get a chance to thank you for the great time we had there for my mother’s 90th birthday. Most of my family was here from out of town – big cities with lots of wonderful places to eat.They all RAVED about EVERYTHING.The butternut squash soup is ALWAYS something John & I look forward to at this time of year. You wrere all very busy that night , but managed to care care of us, as you always do !!!!! We’ll see you Fri. night for the delicious-looking special !!!!!!! I am writing this note to you for RITA DAVES, she mention to you I’ve been to the rest, many times My name is Jim Vetrino. All the people I’ve taken to the rest.,really enjoy it. Rita mention something about getting the recipe for the ORANGE BLOSSUM CHEESE CAKE can you do this for her? She told you she sent the name to the GOURMET MAGAZINE THE BARSTOW REST and mentioned the cake. I thank you very much. Where about ready to stop in soon. I’ll have to introduce myself to you. We recently entertained our guests, Dolores Ide and Charles W. Mathues III, from Philadelphia. We enjoyed the warm and welcoming atmosphere. Our entrees, which included steak, shrimp with linguine, spaghetti with olive oil, anchoves, garlic, and chicken parmesan, were excellent. We also enjoyed the homemade bread. We ended the meal with a variety of cheesecakes and sorbet. We highly recommend trying Barstow House. Steve, Thank you, Thank you……By the way, the Doc I work with & his wife love your resturant, I have sent many patients your way, who by the way are also very pleased….Keep up the great work. We would just like to pay our compliments to the Chef! We dined there last night with my In-laws and they loved the food and decor as much as we do! Keep up the great cooking! Really enjoyed the veal dish…..deeeelisious! Great pasta too! The veggie dish was out-a-sight….you been out-a-mind before. We’ll be back real soon.